BOSTON — The Bostonian Society on December 17 held a press conference at the Old State House to discuss recent revelations concerning the red book discovered in a time capsule prepared by Moses Gulesian, an Armenian-American who had immigrated to Boston in the late 19th century from Marash in the Ottoman Empire. The time capsule, actually a copper metal box, had been placed inside the head of the copper sculpture of a lion on top of the Old State House. The red book and the time capsule were on display, and Brian LeMay, president and executive director of the Bostonian Society and Elizabeth Roscio, Archivist, Bostonian Society (caretaker of time capsule) spoke. Julie Hedgepeth, Communications Associate of the same society, facilitated the meeting. 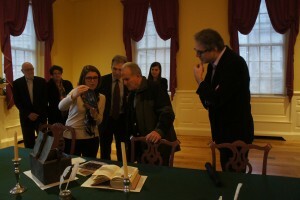 Architect Donald (Don) Tellalian, involved in restoration work of the Old State House, participated with his wife Barbara, and Marc Mamigonian, academic director at the National Association of Armenian Studies and Research, was present. Press representatives in attendance included Steve Kurkjian of the Boston Globe. The existence of the time capsule had been forgotten for many decades, but a descendant of one of the men involved in the preparation of the contents of the capsule had found some notes indicating its existence and inquired about it to the Bostonian Society. Independently, the Tellalians became aware of its existence through old records. When the appropriate time for renovations of the sculptures arrived in 2014, the Bostonian Society was ready to investigate further. Restorer Bob Shure of Skylight Studios used a tiny fiber optics camera to scan the inside of the head of the lion. This confirmed the existence of a shoebox-size object inside, and so the crown was removed and the capsule found, but a new mystery emerged. A red book, titled Papers Relating to the Foreign Relations of the United States, with the Annual Message of the President Transmitted to Congress December 7, 1896, and the Annual Report of the Secretary of State (Washington, 1897) was found placed at the top of the contents of the snug metal box. Puzzlingly, this volume was not listed in the contemporary accounts of the time capsule’s contents in a 1901 newspaper article. Initially this led to the thought that it was merely “filler” material for the box, but Don Tellalian, while looking at the book together with Roscio, noticed that a page of this book, was folded over. The book contained official US diplomatic correspondence, and the section marked by the fold described the Ottoman oppressions of Armenians during the Hamidian massacres of 1895-6. The Tellalians realized what this signified, for they also had been researching the life of Moses Gulesian, who fashioned both the sculpture and the time capsule. In 1901, the wooden figures of the lion and unicorn over the roof of the Old State House, themselves replacements for the originals of 1713 (probably burned in 1776 in an anti-English impulse), were dangerously dilapidated and Gulesian was commissioned by the mayoralty to replace them with heavy copper replicas. Gulesian’s personal background would have given him great motivation to add something concerning the massacres of Armenians to the time capsule. When only a 17-year-old newly trained coppersmith, Gulesian left his home in Marash and came to the US in 1883 against the will of his parents. He spent his first night in New York on a park bench but soon found an Armenian compatriot, and worked for six months in his carpet shop before moving to Worcester. Worcester was an easier environment for a newcomer to navigate than the big metropolis of New York City. There Gulesian studied English and worked in a coppersmith’s shop for two years. He then moved to Boston where he continued to work in this field for two more years. In 1889 he opened his own copper, zinc and sheet-iron working shop. It succeeded so well that the next year he began building a six-story factory. He married an American woman, Cora Plummer, in 1891. Gulesian soon became involved in the movement to help Armenians in the Ottoman Empire, who were undergoing various oppressions in the 1890s. He became the recording secretary of the United Friends of Armenia in 1894. Julia Ward Howe, the suffragette and abolitionist poet and author of the “Battle Hymn of the Republic,” was its president, and William Lloyd Garrison, Jr. another noted abolitionist and activist for women’s rights, its treasurer. Gulesian constantly lectured on the oppressions of Armenians and worked to raise money for this organization. In 1896, some Armenian refugees began to come to America, and Gulesian prepared a floor in his factory for them as a refuge. Some 115 stayed there by the fall of 1896 until work and more permanent lodgings were found for them. Gulesian’s own family members suffered greatly during this period, with several being wounded, but he succeeded in bringing them to the US by 1897. Gulesian became successful, aside from his metallurgical work, in buying and developing real estate, and by 1905 had amassed a considerable fortune. He became a member of the elite of Boston society, and was sensitive to issues of American historical importance. At the end of 1905, he offered to purchase the USS Constitution, nicknamed Old Ironsides, from the US Navy so that it would be saved from being destroyed. This sparked a general movement in favor of preserving the ship so the Navy changed its mind and Congress approved of its restoration. Gulesian became active in American politics and made an unsuccessful run for the US Senate in Massachusetts in 1936 as a member of the Townsend Party (promoting a type of Social Security plan more liberal than what the US eventually adopted). He died in 1951. The Old State House, the seat of government of the Massachusetts Bay Colony, which later became town hall and then the state house, is the earliest surviving public building of the original 13 colonies which became the United States. It now serves as a museum and historic site. The Bostonian Society was founded in 1881 to preserve this edifice, where so many historical events important for American history took place (see www.bostonhistory.org). The old time capsule was replaced with a new one during the restoration, and among the items included is an explanatory essay by Donald Tellalian, “Old State House Lion Unicorn: An Unfolding Story” (available to read at http://bostoniansociety.blogspot.com/2014/07/old-state-house-lion-and-unicorn.html). Meanwhile, interest in the time capsule and the mystery of the “red book” has been surprisingly extensive, and global, according to LeMay. Many articles have appeared in newspapers in the US and abroad (see last week’s Mirror-Spectator for one example). This interest may eventually lead to more light being cast on the activities of the prominent early Armenian-American Moses Guleserian in late 19th and early 20th century Boston.